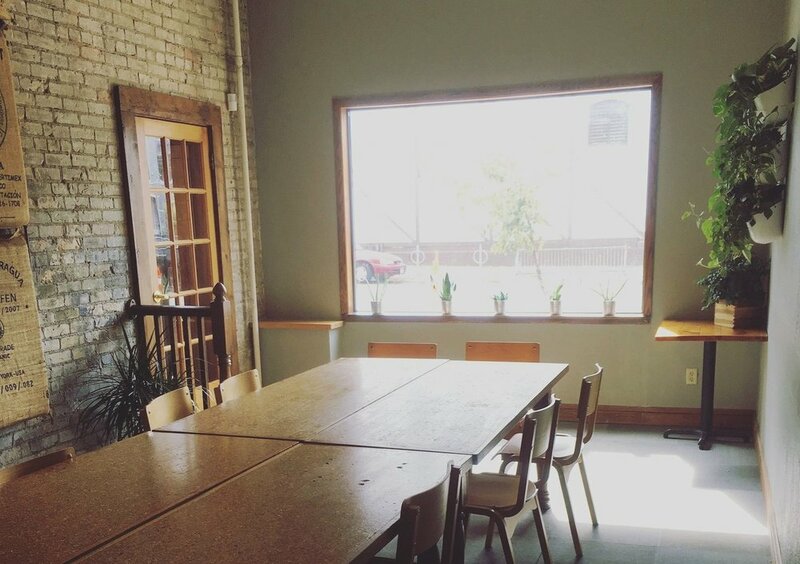 Our private meeting room and event space accommodates up to 25 people (20 seated). There is a $10/hour rental fee. Nonprofit and community groups receive a $10 food and drink credit per meeting. The space is suitable for community meetings, bridal and baby showers, dinner parties and private dining, birthday parties, family reunions, and more! Please note: we do not allow outside food brought in for an event. AV Equipment: For your presentation needs, there is a flat screen TV monitor in the Common Room with an HDMI input cable. We don’t have any HDMI adapters on site should your computer not have this connection option. WiFi: The Common Room has high speed WiFi, but please note that our WiFi is off from 10 am to 1 pm on the weekends (peak weekend brunch hours). If you have booked the Common Room during these times, and need WiFi - please contact us at least 2 days in advance, and we can setup a working WiFi password for your event. Ordering Food for the Common Room: If you're interested in pre-ordering food for your Common Room booking, please check in with our catering staff at catering@commonrootscatering.com and we can set up an order for you. Fine print: Cancellations made at least one week in advance will get a full refund of your booking fee. Please call the cafe to cancel a booking or e-mail commonroom@commonrootscafe.com. Cancellations can't be made through our online booking system. The Common Room can be reserved Monday - Friday from 7:15am - 8:45pm and Saturdays & Sundays from 8:15am - 11am & 2pm - 8:45pm. Reservations are accepted up to three months in advance. Feel free to e-mail or call 612-871-2360 (press option 4, then option 1) with any questions. Thanks for using the Common Room! Select the date. Scroll down to see if your desired time slot is available. If you are unable to select your date and time, it is unavailable. Click on the time you want for your meeting and click the green "book" button. Modify the details of your meeting and enter payment information to confirm your booking. Please note: the room can't be reserved Saturday/Sunday from 11am-2pm. We open the room for our brunch crowds. Exceptions can be made on a case by case basis for special events. Please contact us to inquire.